An impressive and substantial former farm house with extremely generously sized accommodation throughout. The detached property has double glazing and gas central heating and feature, full width, bi-fold doors in the large open plan living room opening out to the rear garden. In brief the versatile accommodation comprises reception hallway, open plan living/dining/kitchen space, separate utility and cloakroom, three further good sized reception rooms and access to a small cellar. To the first floor there are five bedrooms with the master having both a separate dressing room and a ‘must view’ en-suite with a double walk in shower and separate free standing bath and a family bathroom with large jacuzzi bath completes the living space. 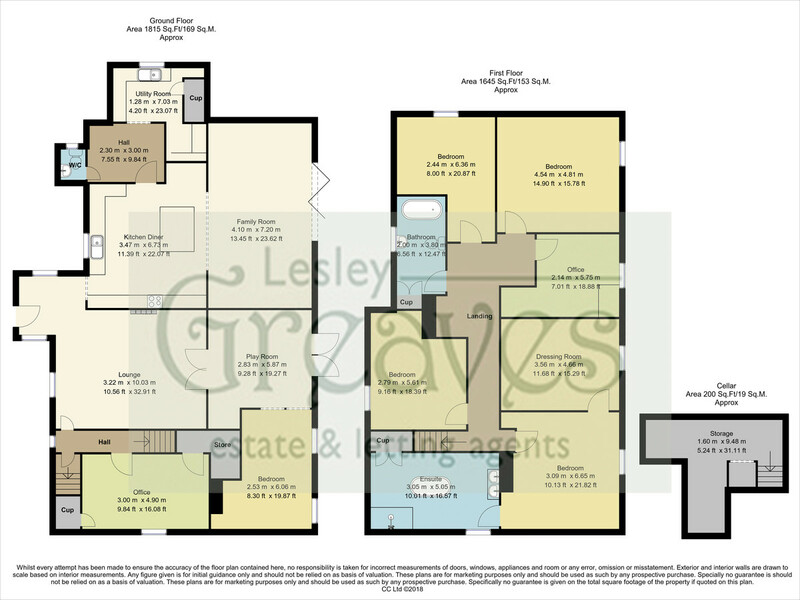 There is also a detached, two storey outbuilding which has been partly converted on the ground floor and offers further scope to develop (subject to planning consent). To the outside the courtyard parking is accessed via electric gates which is shared by the two other converted properties within the development. 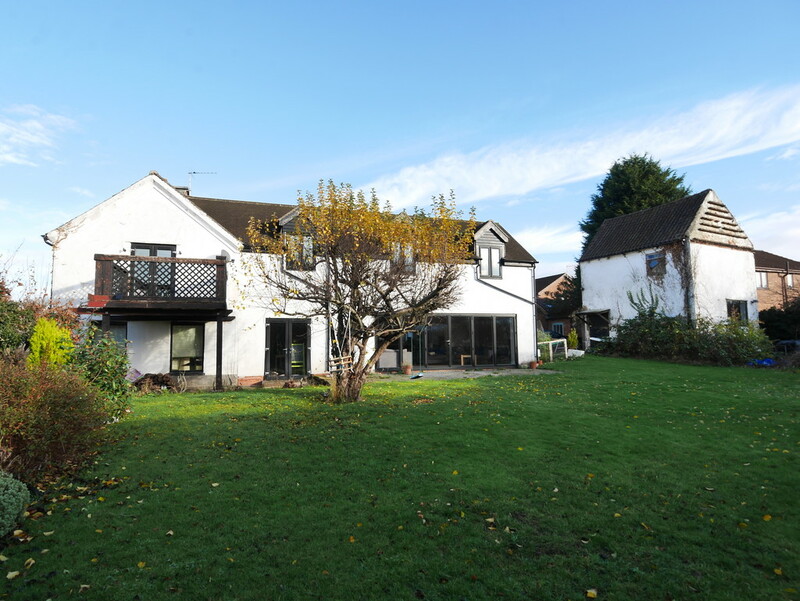 To the rear of the property is a good sized garden which is mainly laid to lawn and has a good sized patio and barbecue area all edged by a range of mature planting. RECEPTION HALLWAY Entrance door with double glazed windows to the side, laminate flooring, radiator and open through to the reception rooms. KITCHEN DINING SPACE 16′ 8″ x 12′ 5″ (5.09m x 3.80m) A contemporary fitted kitchen fitted with a range of cupboards with butchers b;lock style work surfaces over, central work/food preparation station with bench seating and cupboards and drawers under, space for a range style cooker, space for an American style fridge freezer, stainless steel sink unit and drainer, integrated dishwasher, laminate flooring, double glazed window, open through to the living space and separate utility room. UTILITY ROOM Tiled Floor, radiator, cupboards and work surface, stainless steel sink unit and cupboard housing the gas fired combination boiler. CLOAKRROM Low flush WC, wash basin and radiator. LIVING SPACE 24′ 2″ x 14′ 4″ (7.39m x 4.38m) Large open plan living space with laminate flooring, radiator and full width bi-fold doors allowing natural light to flood the space and allow access out to the rear garden. SITTING ROOM 15′ 11″ x 15′ 2″ (4.87m x 4.63m) uPVC double glazed window to the front, feature fireplace, beams to the ceiling, radiator, laminate flooring, door to the inner hallway and glazed double doors through to a third reception room. RECEPTION ROOM 27′ 5″ x 15′ 3″ (narrowing to 3.67m) (8.37m x 4.67m) Split level with double glazed French style doors out to the rear garden and two uPVC double glazed windows overlooking the rear garden, wall light points, recessed lighting, laminate flooring and radiator. INNER HALLWAY Window, door through to a fourth reception room, door to the cellar and stairs to the first floor landing. RECEPTION ROOM 13′ 5″ x 9′ 8″ (4.10m x 2.97m) uPVC double glazed window, laminate flooring, radiator and two store cupboards. FIRST FLOOR LANDING Doors to rooms windows and light wells. MASTER BEDROOM 15′ 2″ x 14′ 11″ (4.63m x 4.56m) uPVC double glazed French style double doors out to the balcony, radiator, recessed lighting, open through to the en-suite and door through to the dressing room. DRESSING ROOM 14′ 11″ x 11′ 7″ (4.57m x 3.54m) uPVC double glazed window, radiator, recessed lighting and loft access. EN SUITE 16′ 4″ x 10′ 0″ (4.99m x 3.06m) An impressive en-suite with double glazed windows, laminate flooring, double shower cubicle with full height glass screens, free standing bath, twin wash basins, radiator, store cupboard and recessed lighting. BEDROOM 13′ 3″ x 12′ 2″ (maximum measurements in to recess) (4.04m x 3.72m) uPVC double glazed window and radiator. BEDROOM 14′ 0″ x 14′ 0″ (4.29m x 4.29m) uPVC double glazed window and radiator. BEDROOM 10′ 9″ x 8′ 11″ (maximum measurements) (3.30m x 2.74m) uPVC double glazed window and radiator. BATHROOM 12′ 5″ x 7′ 7″ (3.81m x 2.32m) Large jacuzzi bath with shower head over, wash basin, low flush WC, Opaque double glazed window, tiled floor and radiator. OUTSIDE the front of the property is accessed via electrically operated gates where there is a block paved driveway and allocated parking spaces. To the rear is a good sized garden with a large lawn and patio as well as a diverse range of mature planting. There is also a two storey, partly converted, outbuilding; which may be able to develop further subject to necessary planning consents being obtained. OUTBUILDING The outbuilding has a ground floor measuring 5.32m x 4.60m and has power and light as well as laminate flooring, window and stable door. The upper room is accessed via external steps. The first floor room has not yet been converted.